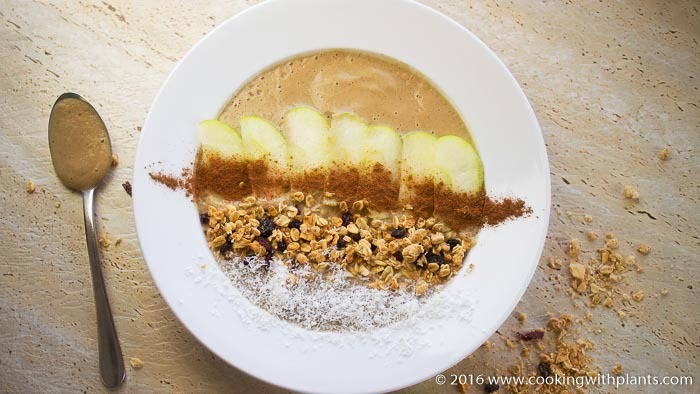 This apple pie smoothie bowl tastes great and is loaded with nutrition! Whether you are looking for a quick breakfast idea or just feel like something sweet and delicious, then this hits the spot. Enjoy! Place all smoothie bowl ingredients in a blender. Pour into a bowl and top with any toppings you like. See video above this recipe for ideas on what I used. Delicious!! Will be enjoying this a lot!! With a minimum of ingredients, and a few minutes to put this together, looks like a delightful dish. thanks for sharing your creative and delicious dishes. Quick and easy for a winning recipe. Thanks so much. nice! healthy nutritious! recipe thanks for sharing !